If for some voters the 2016 Presidential election came down to a kind of personality contest where the candidate that won was the candidate to whom the television-viewing audience could relate, how might we explain the last eight years? It’s fair to say that we didn’t have a chance to form an emotional attachment to Barack Obama through the channels afforded by the entertainment industry before his Presidential campaign in 2008 (that would come later), but here’s where things get interesting. It’s not only about fame; it’s also about charisma: it’s about being able to galvanize a room of average people in the first few minutes of a stump speech. The West Wing’s Jed Bartlet could do it. Barack Obama can do that too. Those who hadn’t seen it before saw it in July of 2004 when he delivered the keynote speech at the Democratic conventionand set the room, if not the whole of the Democratic party, on fire. 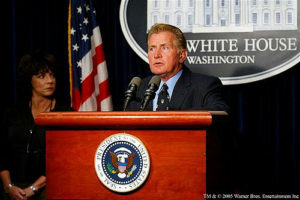 One of the overarching narratives of the sixth and penultimate season of The West Wing is the search for a presidential candidate to replace the beloved President Bartlet as he nears the end of his second term. The contenders include not one, but two Vice-Presidents and a dark-horse young congressman from Texas who was supposedly based on a certain young congressman from Illinois). The question was: “Who’s The Guy?” (And make no mistake, it’s always a guy, especially in 2004 when season 6 aired, but that’s another issue for another day). Even though Sorkin and other cast members of the show have claimed that President Barlett would endorse Hillary Clinton, I think it’s fairly obvious to point out that in 2016 Hillary Clinton was not The Guy. Neither, for that matter, was Bernie Sanders. Bernie might have been closer to the mark, but neither candidate read as Presidential in the way that Jed Bartlet or his successor Matt Santos, played by Jimmy Smits, did. The Democrats needed to run Martin Sheen, or someone else much closer to Jed Bartlet. Someone worthy of the title The Guy. Donald Trump might seem to lack charisma in the traditional sense, he’s nothing if not an oversized personality who clearly knows how to connect to at least a certain demographic. And in 2016, that demographic turned out at the polls. Donald Trump as it turns out, was The Guy to the shock and dismay of many Americans. Ultimately, party leadership on both sides seems to think that elections are about policy, about platform, about ideals and ideas and substance. For some of us, that’s true. In a perfect world, it might even be considered a universal truth. But as we were reminded on Election Day, some of us rather rudely, the world that we live in is not a perfect world. What if what we’ve learned this week is not only that our country is more divided than we thought in certain unsettling ways, but also that many Americans don’t vote for policy or platform, or ideals, or substance? What if they’re voting for A Personality? What if they’ve been voting for personality all along? Or at least since John F. Kennedy? It makes a certain kind of sense. It explains the appeal of George W. Bush, the multi-millionaire’s son who managed to convince a country that he was just a regular guy, someone they might want to hang out with around the fire pit, perhaps over beers and BBQ. It explains the appeal of Bill Clinton who broke out the shades and the sax on Arsenio Hall in 1992. It especially explains the appeal of Barack Obama, who The Christian Science Monitor reported in 2008 was “something rare and special, the heir to such charismatic predecessors as John F. Kennedy and Robert Kennedy.” It also explains the failure of Al Gore and John Kerry, both of whom were very intelligent, highly qualified, and on paper, strong contenders for the Oval Office, but who could not connect to voters who weren’t already committed to voting along the Democratic party line. It explains the failure of John McCain and Mitt Romney as well. In short, the way to beat Donald Trump wasn’t to be a better politician. It wasn’t to have more experience or more integrity. For many Americans on November 9th, 2016, those things didn’t matter. For them, the electoral process was not one based in logic, reason, policy, or substance. Instead it was based in emotion, and many voters on both sides don’t like politicians. Some are ambivalent while others actively despise the political establishment and everything for which it stands. The problem with Hillary wasn’t just that she’s a woman; it wasn’t just that she’s a Clinton; it wasn’t even that she’s a Democrat.The problem with Hillary Clinton is that the establishment counted on voters caring enough about policy and substance to override any and all of the other issues they might have with her candidacy. That is, the party leadership likes to think that electoral politics is about ideology above all else. But maybe we saw in November of 2016 is that for many voters, it wasn’t about ideology at all. It was about celebrity, pathos, and public persona. If we take seriously the claims that many Trump voters are making about voting despite the ableism, anti-semitism, bigotry, misogyny, and xenophobia, and all the rest of the -isms in that “Basket of Deplorables,” granting that it might be a big if for some, the way to beat a Trump, the way to beat the character, the celebrity, is to run a better character, a bigger celebrity, or at the very least, someone to whom average Americans could relate, before they decided who to support. In short, the Democrats needed a Martin Sheen or a Jimmy Smits. They needed The Guy. We all did.